Video has become one of the most powerful ways to speak to your audience. In the recent 2016 VNI Complete Forecast, Cisco predicts that video will represent 82% of all traffic in the Internet. The trends are not very different for online businesses who are leveraging videos to communicate with their customers. Invodo’s ‘Video Statistics – The Marketer’s Summary 2016’ report quotes explainer video company Animoto saying that 4x as many users would rather watch a video about a product than read about it. According to a 2013 study by Usurv, if you want visitors to your site to share and interact with your content, delivering it via video is the best way to go. Consumers are 39 percent more likely to share content if it’s delivered via video, and 36 percent more likely to comment and 56 percent more likely to give that video a coveted ‘Like’. This has only become better and Facebook, the biggest social network in the World venturing out as video platform by monetising video content creators on their platform and declaring a war on YouTube is a sign of how videos online could radically change the online advertising ecosystem. 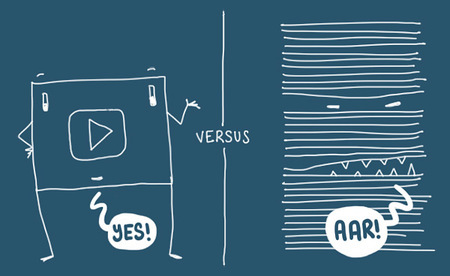 Most of us already know the answer to this – videos, when made right, are simply more engaging. While that argument stops at the limitations of subjectivity, it helps to look at this from a scientific perspective. Visual Teaching Alliance, in one of their studies, states that videos are processed by the brain 60,000 times faster than text. This effectively means that your cognitive system can process information with much lesser effort when it comes to comprehending video over text. As a thumb rule, the human body is built to lessen the cognitive strain it experiences and this ‘laziness’ attribute clearly puts us in favour of video over text. It is understood that the brain gets a much better workout when reading versus watching a video, and the process requires a longer attention span and deeper cognitive commitment. Reading is scientifically considered to be an active process. When we read an article, we don’t just look at the words in front of us — we create thoughts about that information, activating our mental structures. Reading requires the engagement of “inner voice,” which dials up our attention span. That means that careful reading is not an automatic process, but rather occurs when we actively process what we are reading. Watching a video, however, is a passive process. It’s much less demanding and more of an automatic process, requiring a lot less energy and effort on behalf of the person who’s watching the video. Don’t underestimate the power of Text yet! While watching a video, a person tends to loosen up absolute control over his/her environment. A good example of this is engaging with a movie. Watching a movie can facilitate feelings of dissociation from reality and can offer mental escapism. There are a lot of instances where a user might want to have active control over the environment, especially while taking decisions. As discussed in detail in this article by Psychology Today there is adequate research that establishes that when internet users must make an important decision — such as purchasing insurance or other financial products, for example — their more rational, detail-oriented modes become active and they will prefer to have control over the situation and text helps with that. When’s the last time you talked about missing out on a part while watching a video. It shouldn’t be a rare experience for most of us. While a video conveys information in a timeline bound manner, there are moments when you might want to go back and confirm what you comprehended. This is easier in a non-transient medium like text or print. Why is this important? There are instances where it’s important that the viewer or reader gets complete information about something before making decision. Text or print helps with better information cues compared to videos that are transient in nature. For those who are confused about what medium to use to convey your thoughts or market your product, there is an interesting approach that you could try – text on videos where you marry the best of both the worlds. By adding contextual text on a video, the video creator is basically enabling the audience to get better hold of the information portrayed by the video within the short time it plays. A lot of people call them video annotations. How is this helping? Connectionism theory of information transmission in Cognitive Sciences talks about a person being able to retain information about an element better with more number of cues provided to him that describes the element. For example, you will be more confident while answering “Do you know Mr. George in your neighbourhood who plays tennis daily morning” compared to “Do you know Mr. George”. The reason is simple – you have more context to retrieve a specific information point. Text on videos help with that. It might also be interesting to check out the top reasons why you should add text on videos. A lot of media publishing houses have already acknowledged the value of text on videos. You won’t be surprised to know that most of the short form videos on Facebook follow the use of text on videos very religiously. Here is, for example, a video published by AJ+ on the message given by U.S. President Mr . Barack Obama on the upcoming Presidential Elections. Note: If you watched the above video you will realise that you are able to recall a significant part of Mr. Obama’s speech. Emphasising on the important parts of the narrative using text or typography helps us assimilate the information better. It’s important, though, to add text that goes well with the video. Plain text on a video can spoil the aesthetics of the video. The font, color, animation and other attributes of the text should align really well with the theme of the video and if done right, they could add a better look and feel on the video while helping the audience with better content retention. Hope you will soon try out the magic of text on videos. Let us know how it goes. If you are confused about what tool to use, check out this list of popular video editors that help you add text on videos.